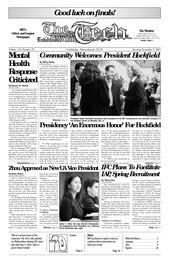 President Susan Hockfield recently responded to questions from The Tech’s news department in an e-mail. The questions and Hockfield’s responses follow. TT: What significance do you attach to being the first woman named president of MIT? Hockfield: We often feel that change comes too slowly, but the last few decades have been a time of rapid change that have brought increasing opportunities for people from all sectors of our society. To some, the election of a woman, and a life scientist, as president of MIT will seem a natural progression; to others, it will seem a remarkable departure from past traditions. Viewed from any perspective, it is an enormous honor to be the first woman, and the first life scientist, to have been chosen to serve as MIT’s president. I have benefited enormously from the pioneering women and men who made it possible for steadily increasing numbers of women of my generation to take on key roles in the academy and throughout our society. Now, we owe it to the current generation of students, and to subsequent generations, to continue the progress toward what we can truly and proudly call a great meritocracy, on this campus and across the nation. I hope that my election to MIT’s presidency will give confidence to women and girls, as well as to people from all backgrounds, to believe that they, too, can take on roles that perhaps have not previously been open to them. TT: What is your top priority as the new president? Hockfield: Clearly, my top priority must be to build on MIT’s strengths and to help the Institute use those strengths to chart its course into the future. I believe deeply in the strength of communities and the power of ideas that come from the people in those communities. My top priority for the present is to learn from MIT’s faculty, students, staff and alumni what they view as the key opportunities and challenges in the years ahead. From the day my appointment was announced, I began meeting with, listening to, and learning from people who know MIT from the inside. I will continue these meetings in the coming months and years. TT: The National Labor Relations Board in July reversed its 2000 decision and reclassified graduate assistants as students, not employees, and therefore unable to organize into unions. During your time as graduate student dean at Yale, what was your involvement in Yale's opposition to the formation of a graduate student union, why did Yale actively deny students the right to organize, and what are your opinions on graduate student unions? Hockfield: The critical role of faculty-student interactions and the individually tailored nature of the very best graduate programs make educational relationships and practices different in important ways from relationships governed by labor law. For that reason, Yale University has held the position that the unionization of graduate student teaching and research assistants is not in the best interests of graduate students themselves, of undergraduates, or of faculty. As Dean, I worked with the faculty, students and staff of the Yale Graduate School to build a stronger community for graduate education and a better environment for teaching and scholarship. Some of the improvements included new academic policies to encourage timely completion of degree requirements, increases in the financial support for graduate study and the institution of formal reviews of graduate programs. We also strengthened career advising, teacher preparation and other student life activities in ways that brought together graduate students from different academic disciplines. TT: How important do you think it is for a President of MIT to hold a degree from MIT? Hockfield: I am spending a great deal of time learning about MIT, and I can certainly appreciate that someone who already knew MIT would not have as much to learn -- like the building and course numbers! There was a time in this country when our major educational institutions looked only to their own graduates for faculty and for academic leaders, but now all leading colleges and universities seek out and try to bring the most able individuals to their campuses. Coming from the outside, I bring a respect for MIT’s great accomplishments and for its extraordinary culture of excellence. As I learn about MIT activities, traditions and practices, my questions provide a chance for MIT’s students, faculty, staff and alumni to articulate what they find valuable about this Institution and, in the process of articulation, stimulate a renewed appreciation for the Institute’s values and ambitions. Over the years, MIT has enjoyed great leadership by people who graduated from the Institute and by those who did not. No matter the background of MIT’s president, the central task must be to preserve the unique character and culture of MIT while guiding the Institute’s responses to the changing academic and research environments, so that MIT can retain and expand its leadership in this nation and around the world. TT: Do you believe the president of a highly-regarded university such as Yale or MIT should speak publicly about current political or social issues? Does advocating for science include advocating for the solutions or positions supported by science? All great universities have several important missions. Most important among these are the creation of knowledge and its dissemination to those in our own community and to the world at large. There is a long tradition of MIT people serving as advisors on matters of critical importance to government and society, both here and in other parts of the world. MIT, as an institution, has earned the reputation of being a source of unbiased and objective knowledge. As individuals, we will maintain and enhance this reputation by using fact-based evidence and rational argument in our public statements and engagements, just as we do in our discussions and debates about our research and education on campus. TT: When situations arise where the U.S. government makes decisions contrary to or ignorant of scientific knowledge, as has happened in the past few years, should a university take a strong stand on the decision? Would you be willing to risk government funding for MIT or Yale to contradict what you saw as a scientifically incorrect or unfounded decision? Hockfield: It is my strong belief, as president of MIT and as a U.S. citizen, that when we consider public policies it is important that we obtain the best evidence available and debate the issues in the light of reason. MIT has a well-deserved reputation for establishing internal policies that align with the highest principles of advanced research and education. And presidents of MIT have played a major role in advancing national policies for science, technology and education that, similarly, align with those principles. I will do all I can to continue that MIT tradition, keeping a strong voice for the good that comes from solid investments in, and sound policies for, higher education and research. TT: Universities are still adjusting to the conflicting natures of undergraduates as both adults and underage drinkers. How strong a role do you think a university should take in policing its students personal lives? That is, is the current litigious trend towards in loco parentis administration appropriate? Hockfield: College is a time for young people to stretch their minds, to seek out new experiences, make new friends, and take steps toward greater independence and self-reliance. At the same time, it is the responsibility of the university to provide a safe environment within which such growth can occur. It is a delicate balance, best achieved by students, faculty, and administration working together, to create caring communities that encourage and support exploration and learning. TT: The Chronicle of Higher Education reported that colleges nationwide had seen an 18 percent drop in international graduate student admissions this year. What can be done by universities to ensure that increased security measure do not lead to a further drop in international admissions? Hockfield: National security is a very real and very serious issue for all of us today. American universities have served as the gateway for some of the best minds in the world to join our nation’s commitment to improving the lives of all people. Balancing these risks and opportunities requires insightful development of national policies that take into account the important role and distinctively open cultures of universities. MIT has traditionally had a powerful voice in the articulation of national policies, a tradition I will continue. The recent drop in the admission of international students to American graduate programs, including MIT’s, endangers the vitality of our educational institutions and the strength of the nation, particularly in science and engineering. MIT, together with our peer institutions, has encouraged the U.S. government to adopt policies and practices that, while responding to national security concerns, would not deter the very best international students from pursuing their education in this country. The good news is that the government has responded in positive and productive ways to the concerns voiced by American universities about visa processes. This summer, the State Department gave students and scholars priority in scheduling visa interviews and substantially decreased the waiting times for visa screening processes. I plan to work on further improving visa processes for international students and scholars and on policies that will continue this country’s great history of welcoming the world’s best minds to our universities. TT: Is relying on private donations a safe way to support MIT's operating expenses? Currently, MIT relies on private donations for several hundred million dollars of its budget. Is that sustainable over the long term? Hockfield: MIT, like all of the major research universities in this country, relies on private donations as one source of revenue to sustain and enhance our academic activities. Over the last several years MIT has had a remarkable fund-raising performance, as evidenced by the achievement of the current campaign’s $2 billion goal. One of the great strengths of American research universities is that our alumni recognize -- and contribute in significant measure to -- the distinctive excellence of American institutions. MIT’s alumni have been enormously supportive of the Institute, giving at an extraordinary, unprecedented level in our recent campaign. Private donations represent only one of the major revenue sources for MIT, with income from grants and contracts, endowment investments and tuition also figuring prominently. Sound financial management requires ongoing assessment of the opportunities and risks of each of the major revenue sources.